Alaskim | Surviving Wildlife, Wildflowers & Wild-Haired Children: Score! WOW! I bet you practically ran to the checkout - I know I would. Don't you just love getting a bargain? I honestly thought you were going to say Hannah Montanna. Good choice! AAAAACK! See ... my oldest daughter was wearing Gymboree way back when the quality USED to be like Hanna. I've never owned a HA dress for Rae -- cause I'm too cheap. Did you clean out the stash, or what?? You could sell them later, for basically what you paid for them!!! You rock! hanna???? seriously?? WOW! I had no idea you could get them there. I love HA clothes. Fantastic quality and washability/stain release. Score is right! :) The girls look adorable in them!! I love Costco too! My husband and I went there on our date nights before we had my daughter. 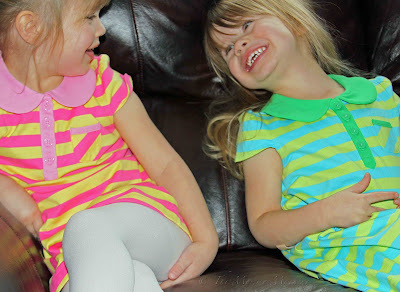 Your girls look so pretty - good spring colors!